May prices are mixed to down, but the future pricing is still looking very good. The May Class III milk and component prices announced June 3 are mixed with the Class III price down 2%, protein down 7%, and butterfat up 2%. 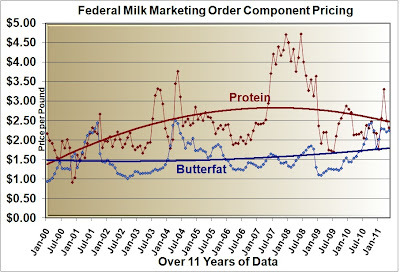 The long term indicators continue to improve and will be reflected in future 2011 milk and component prices. Generally, exports remain very strong and inventories are normal to low. 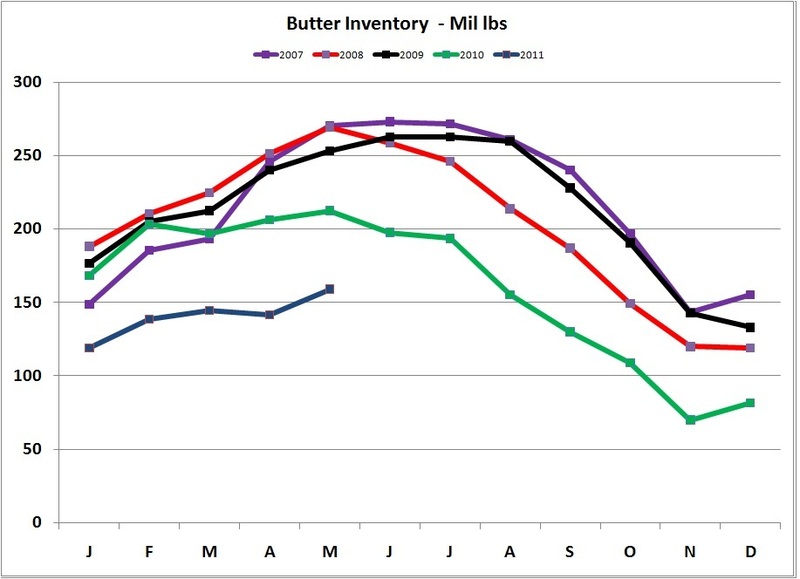 Butter inventories, in particular, are very low. 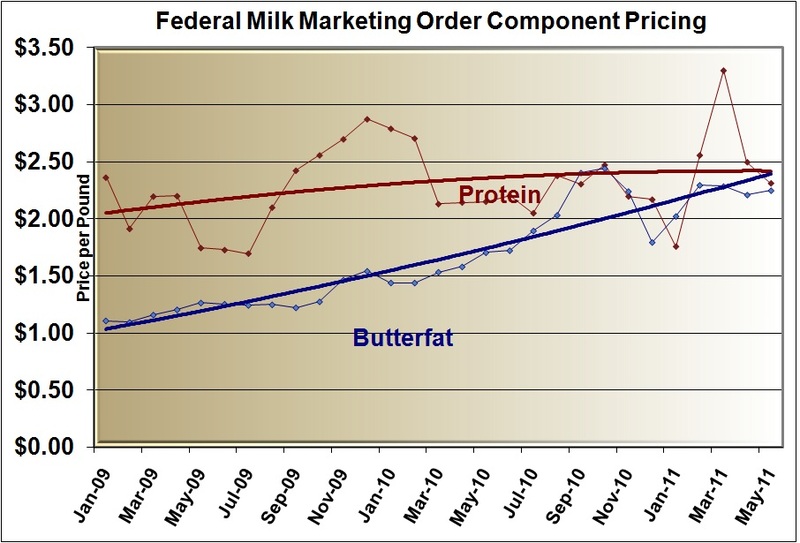 As a result, butterfat prices at $2.25/lb remained much higher than the historical levels and protein at $2.31/lb, although down for the month, remained slightly higher than butterfat . 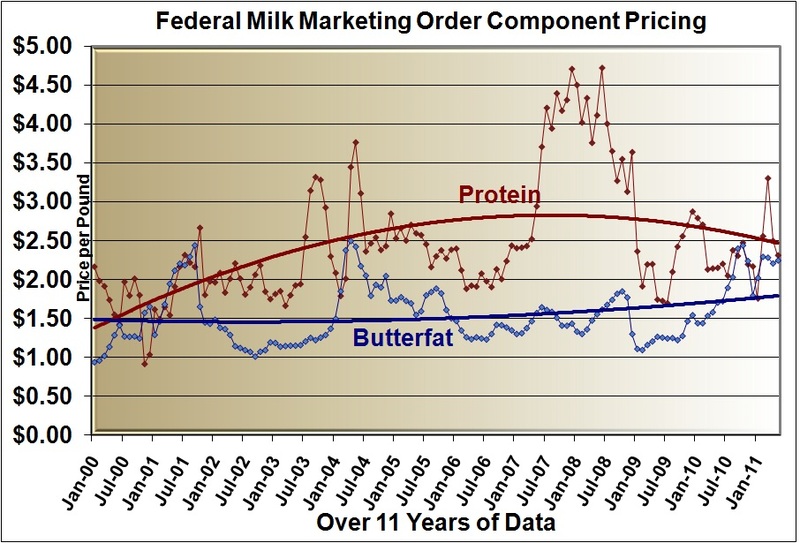 When looking at the data since 2009, the increase in butterfat prices becomes very apparent and is analyzed in the "BUTTER" section below. 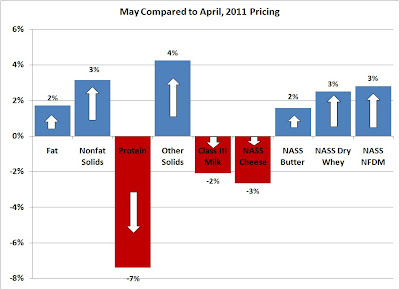 Protein prices have been relatively level during this period. Protein prices are primarily dependent on cheese prices and are analyzed below in the "CHEESE" section. 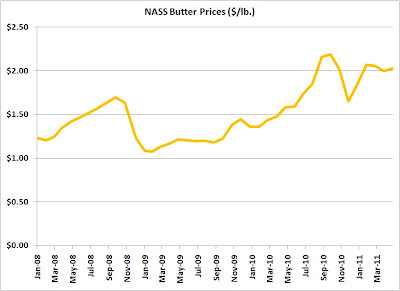 Butter prices remained very high with very tight inventories. This tight inventories will continue for an extended time. 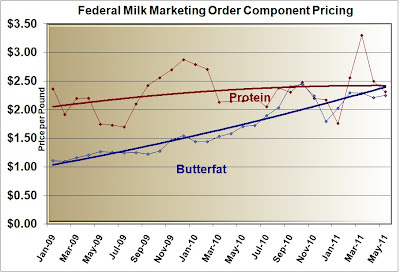 Butter and therefore butterfat prices, will remain above historical levels for many months and probably all of 2011. 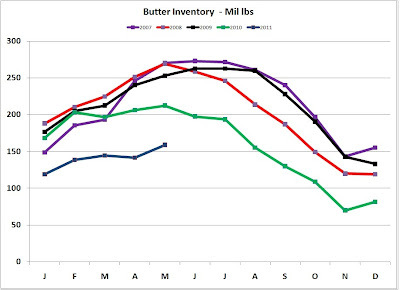 Butter inventories began decreasing just over one year ago and have gotten tighter since then. At current levels the inventories are 40% below the 2007-9 levels. 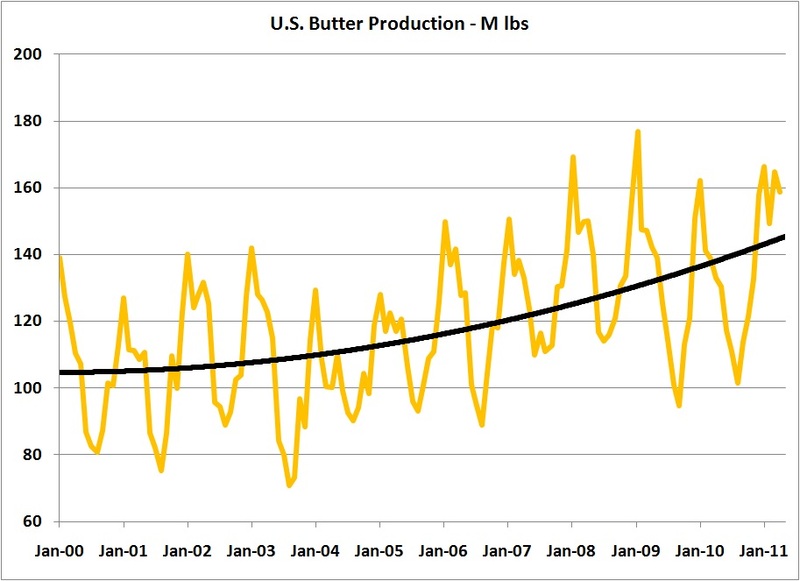 Butter production was flat between the years 2000 to 2005 and began increasing in the period from 2005 to 2009. 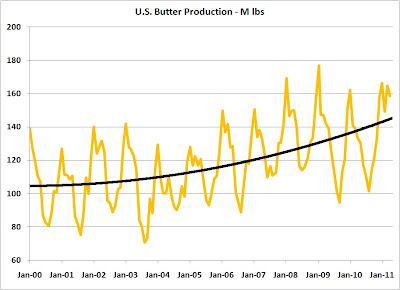 However, butter production fell off in 2010 and has not recovered. 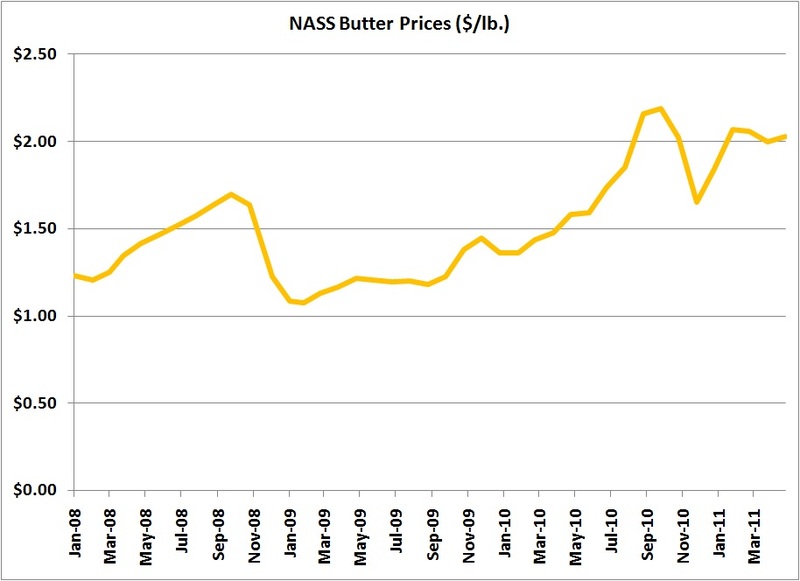 The relatively low butter production combined with healthy exports make for tight inventories and therefore high prices. Net exports are shown below. 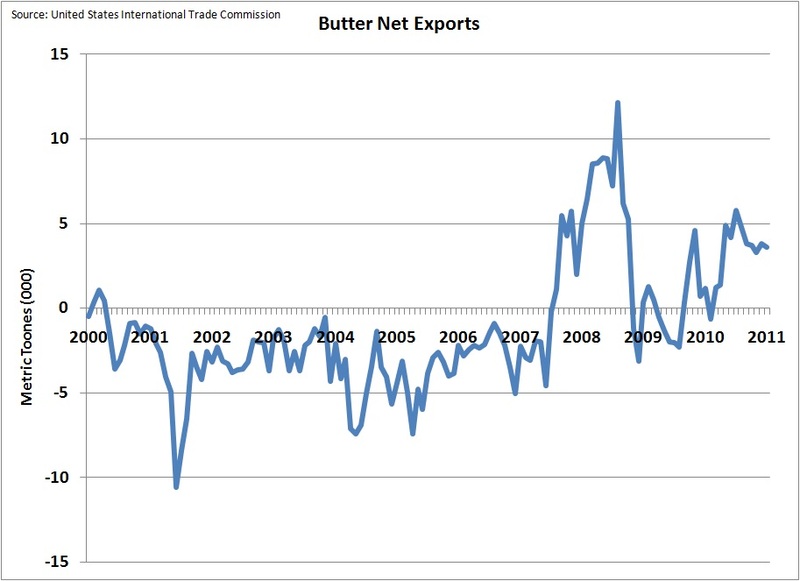 While butter net exports have not reached the 2008 levels, they have continued to rise from 2009 through 2011. 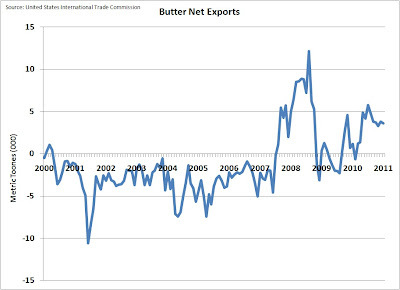 Butter net exports remain positive and carry momentum for further upward movement. 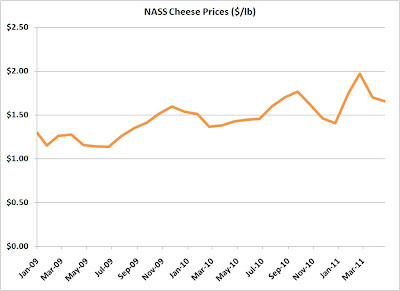 NASS cheese prices have fallen for the last two months. 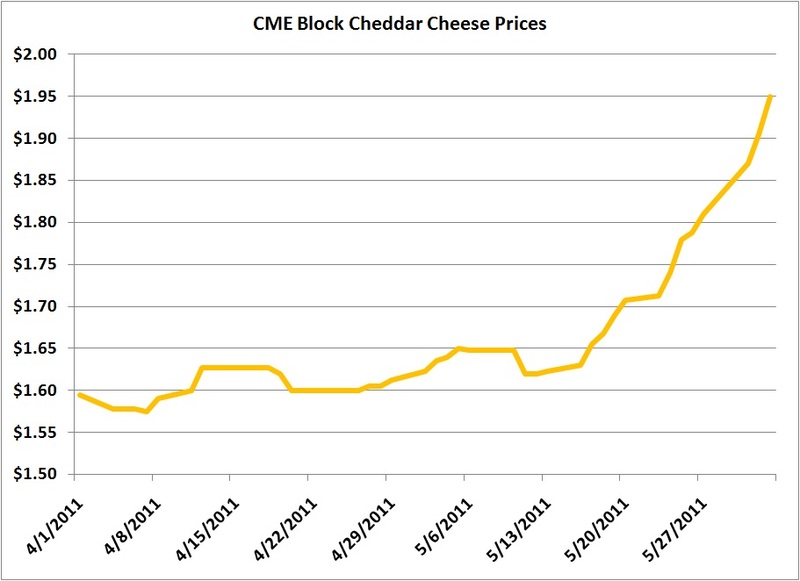 This does not fit the current run-up in cheese pricing seen in the last two weeks on the CME and is contradictory to the lower cheese inventories that developed in 2011. 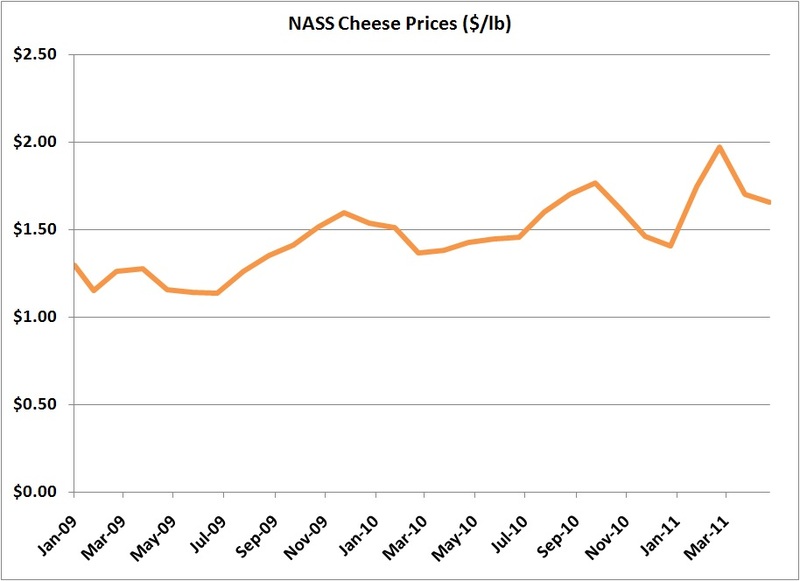 Because markets will rationalize over time, the NASS cheese price can be expected to significantly improve in the near future. 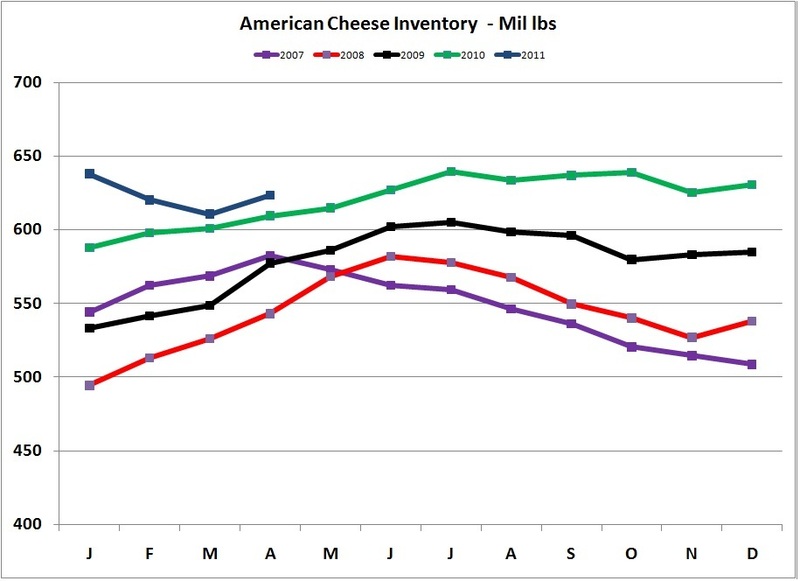 After significantly expanding in 2009, cheese inventories of both natural and American cheese have remained high, keeping cheese and milk protein prices low. 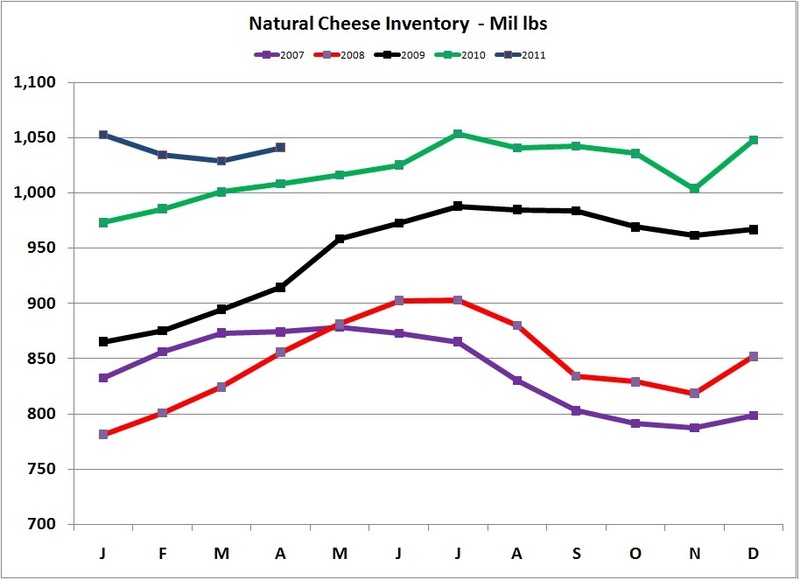 In February and March of 2011, these inventories made a major correction which should be reflected in improving cheese prices. 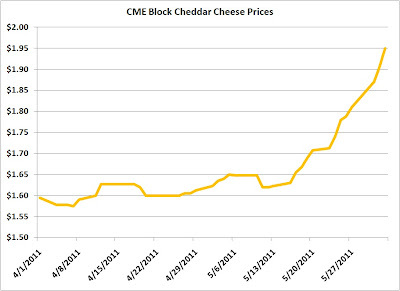 Below are the daily CME Cheddar cheese prices. In the last two weeks, the prices have escalated from the $1.60/lb level to the $1.90/lb level and today, June 3, reached $2.05/lb. 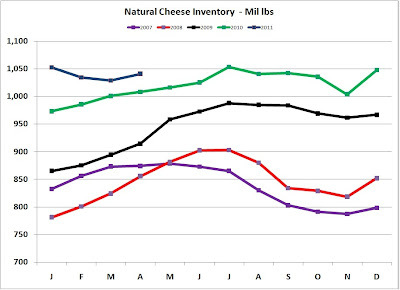 As has been shown is prior posts to this blog, the NASS cheese prices follow the CME cheese prices with about a two week lag. 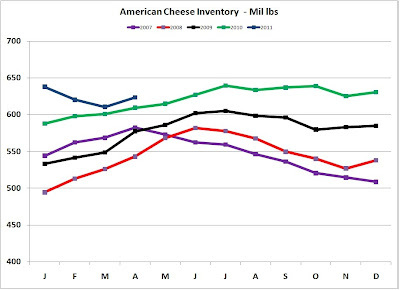 This run-up in prices over the last two weeks will be reflected in June component prices as the NASS cheese prices (on which protein prices are based) begin to reflect the significantly higher CME cheese prices. One of the most important factors behind the increase in cheese prices is strong exports. 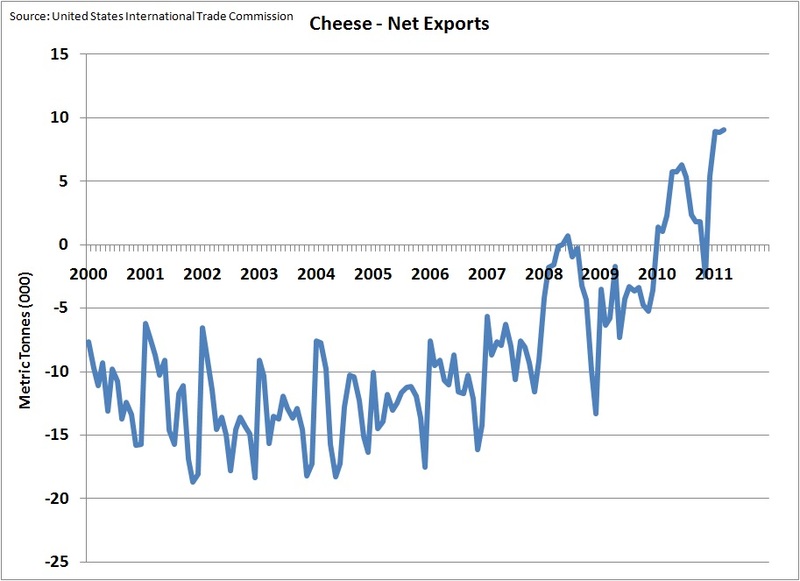 Cheese exports show a long term very positive trend. 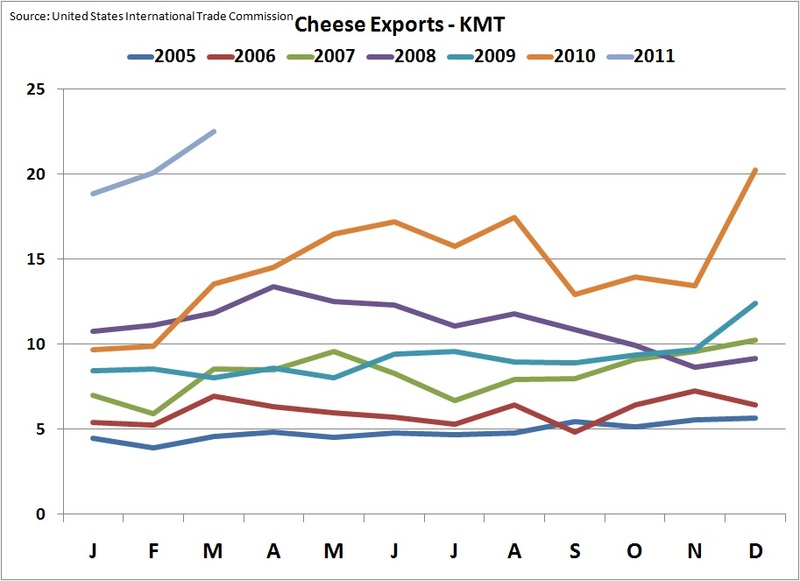 As mentioned in other posts to this blog, there are many programs in place to increase exports and the current weak dollar helps to make U.S. cheese relatively inexpensive on the world market. This increased export activity can be viewed even more dramatically when exports for each year are shown as separate lines. 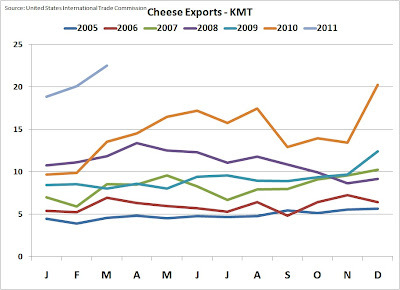 Cheese exports so far in 2011 are running nearly double the level of the prior three years. Cheese prices are the biggest determinant of Class III milk prices. The underlying principals continue to look very good. Class III milk futures are approaching $19.00/cwt reflecting the many positive indicators explained above.